SecurePod is a pre-configured and pre-validated IP video surveillance system based on Intel® Xeon® processors and designed for extreme capacity, performance, scalability and ease-of-use. The SecurePOD package of hardware, software and cameras is built on open IT standards and can be customized for vertical functions and applications. SecurePod is ideal for use across a wide range of video security applications requiring 16 to 256 IP-based cameras. Today and in the future, many IT departments will be tasked with the responsibility to manage physical security systems as the industry moves from analog to digital video surveillance. 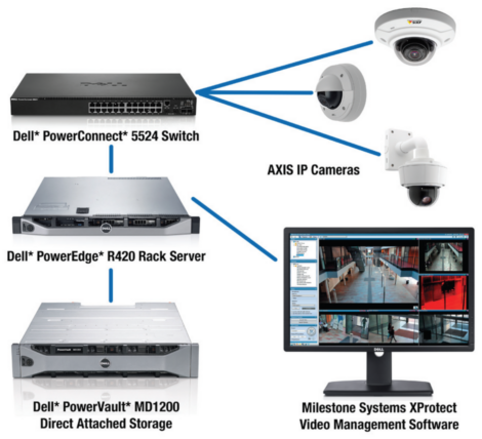 IT industry leaders Intel, Axis Communications, Ingram Micro, Dell and Milestone Systems have collaborated to develop SecurePod for customers in need of a powerful, but simple and secure way to establish their IP video surveillance capabilities.